Synthetic peptide corresponding to Human PTEN aa 355-385. Our Abpromise guarantee covers the use of ab31392 in the following tested applications. WB 1/500 - 1/1000. Detects a band of approximately 60 kDa (predicted molecular weight: 47 kDa). Immunohistochemical analysis of paraffin-embedded breast carcinoma, using anti-PTEN (ab31392, diluted 1:100). Left: Untreated; Right: Treated with synthesized peptide. We want to buy two antibodies in abcam: rabbit polyclonal anti-human PTEN (ab31392) and monoclonal anti-human p-PTEN (Ser 380) (ab76431). 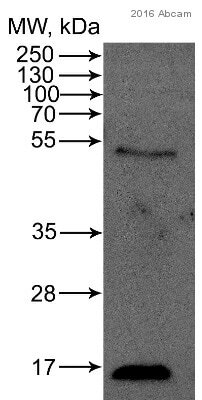 However, we want to know whether rabbit polyclonal anti-human PTEN (ab31392) would recognize both forms - phosphorylated and non phosphorylated - of this protein at Ser 380? 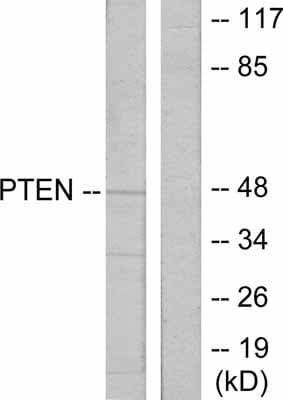 ab31392 reacts total protein of PTEN, both phosphorylated and non-phosphorylated PTEN. Thank you for your enquiry. 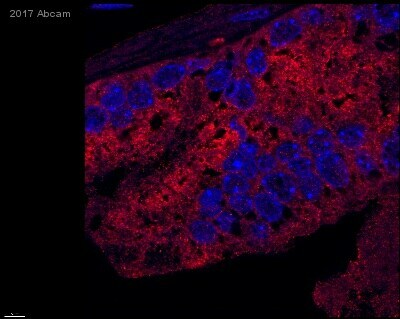 I am sorry to hear that your customer has been having difficulties with this antibody. I appreciate the details that your customer has submitted. I have read their technical questionaire and I have a few comments. Please can you ask your customer to confirm the differences in the samples that they loaded onto the blot that they have submitted. I understand that some are PTEN knock outs. However, I am confused as lanes 3-9 do not have the extraneous bands at 10KDa. Is this a consequence of the proteins not transferring to the membrane? In the blot image lanes 3-9 have two distinctive bands at approximately 47KDa and 60Kda. I consider it possible that the band at 60Kda is the correct target. 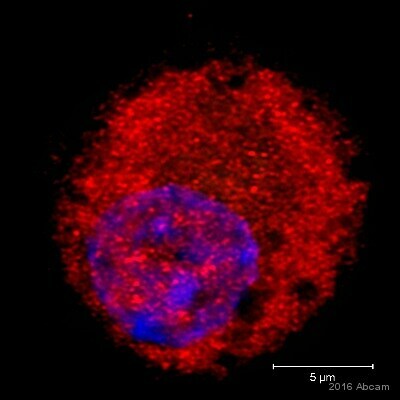 Can you tell me how the KO cell lines were confirmed to be knocked out. Are they heterozygous knock outs? Your customer has been applying this antibody at a concentration significantly higher than recommended against a mass of protein significantly higher than I would recommend. At this point I would like to recommend that an overnight incubation of the antibody is performed using an antibody dilution of 1:500 and 20ug - 30ug of protein per well. 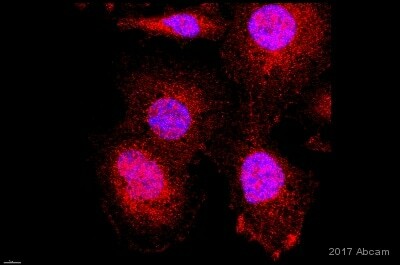 This will serve to significantly improve the specificity of the antibody. Furthermore replacing milk with 3% BSA often serves to improve the specificity of the antibody. Should this not lead to significant improvement please get back in touch with me.